Both women have given several years of service to the public in the legal field and were tipped to be promoted just before the change in government last month. 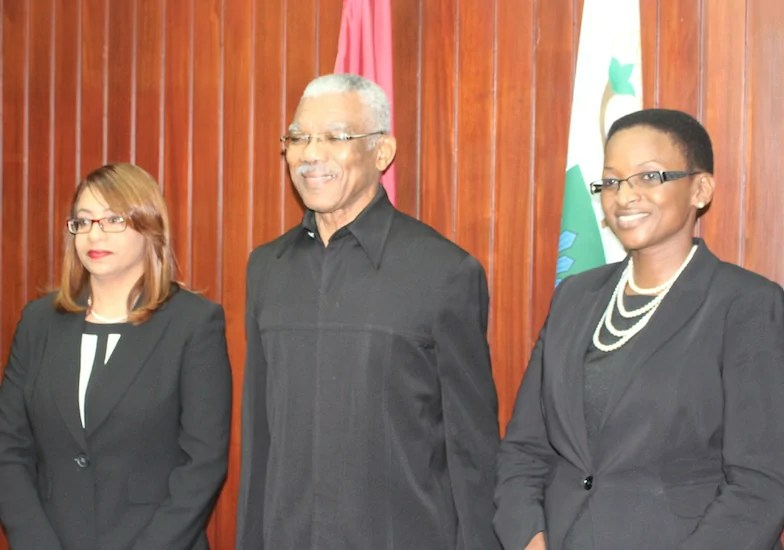 Former Acting Chief Magistrate Priya Beharry and former Deputy Director of Public Prosecutions Jo-Ann Barlow were today sworn in as Puisne Judges by President David Granger during a brief ceremony at the President’s Office. The President has indicated that he will be looking to fill other vacancies that exist for Judges and Magistrates in the near following consultation. Chancellor of the Judiciary, Justice Carl Singh along with Director of Public Prosecution Shalimar Ali – Hack, Speaker of the National Assembly Barton Scotland and a number of government officials were present at the swearing in of the two new judges who both pledged their commitment to the job. Justice Barlow is married to Speaker of the National Assembly, Dr. Barton Scotland. The two new judges have given their commitment to complete all matters expeditiously in the local justice system which continues to face criticism over slothful prosecutions.